Unlike any venue you'll find in the cities, Eleven Acres is known for its peaceful gardens, quiet ambience and expansive spaces servicing dream weddings and intimate functions. 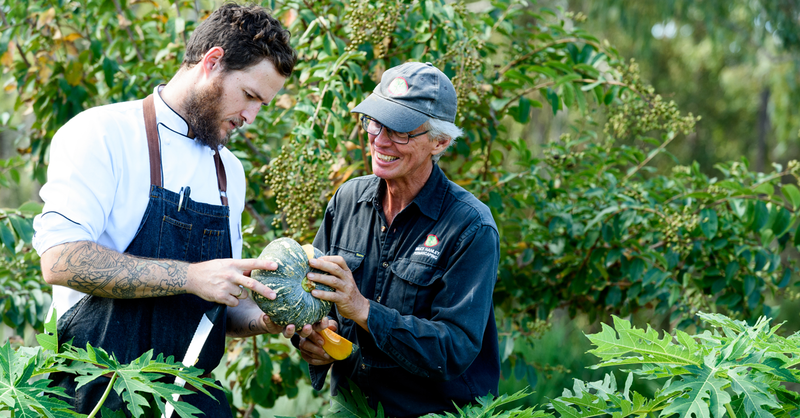 The inspiring surrounds and ambience that Eleven Acres offers can be attributed to their dedicated and passionate landscaper, Bruce, and their creative food the works of experienced head chef, Ben. When talking with Ben and Bruce it's clear to see the passion they have for food, in particular growing their own. Bruce, a landscaper for 8 years with an education in horticulture, education, permaculture design & landscape construction, can be found maintaining the grounds, constructing new landscaping and, his personal favourite, developing food production opportunities. Equally as passionate about food production is Head Chef Ben. Boasting an impressive international career working as head chef in a restaurant in London as well as recently in the Gold Coast it's no wonder this highly-sought after chef is making his mark on the culinary scene in Bundaberg. When not in the kitchen or working on the grounds you can find this captivating pair out in the plucking and vegetable gardens checking on their 'babies' and trying to contain their excitement for what's to come next. As we write this Bruce is working on the development of a fruit orchard out behind the café, expanding the plucking garden and working on plans to develop productive gardens on the lawn areas near the kitchen. Armed with a passion to grow his own and a region full of incredible growers and producers we can see Ben's brain ticking over with all the delicious recipes he is planning to create. For both Ben and Bruce the idea of supplementing as much of their ingredients with self-grown produce is an exciting and rewarding challenge and is sure to see the creation of a number of delectable dishes set to light the fire of foodies everywhere. Where Can I Find Eleven Acres this Winterfeast? Eleven Acres is opening their doors for Fire & Ice at Eleven Acres, an intimate and exclusive degustation featuring self-grown and locally grown produce. When Can I Eat at Eleven Acres? You can find Eleven Acres at 363 Branyan Drive, Bundaberg, open Monday – Friday 8am – 2:30pm, and weekends 7am – 2:30pm.